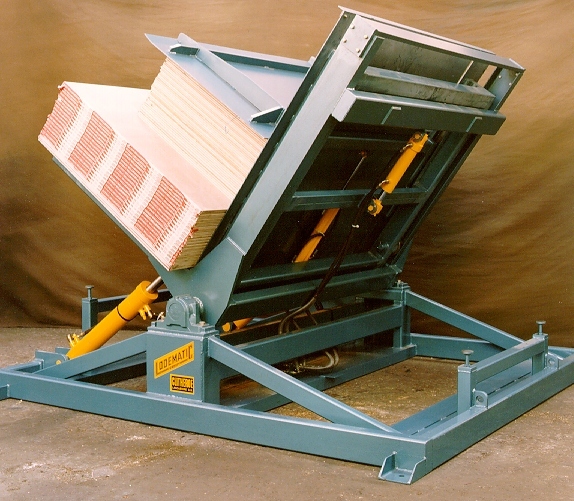 The Lodematic Plasterboard Manipulator enables boards which require attention (such as edge taping) or which have been damaged during the manufacturing process to be easily removed, or replaced, from within a stack. It has been available in Europe for a decade, used by major plasterboard companies and here are a few reasons why they invested in a Plasterboard Manipulator. The current manual method used by many Plasterboard Companies involves the use of a fork lift truck driver and two men who physically remove the boards manually to reach the damaged ones for replacement. If the damaged ones are in the centre of the stack this whole operation of removing the boards, replacing the damaged ones and re-stacking can take up to twenty five minutes. Our machine requires one person and the whole operation can take about five minutes. 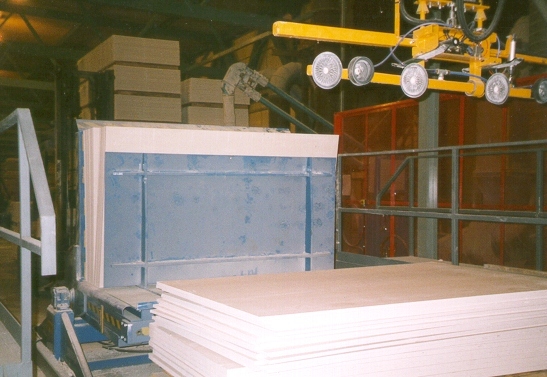 Due to the height of the Manipulator, boards are removed at a height more suitable for the Operator. This diminishes the possible risk of back strain, thereby keeping a far healthier and happier work force. Lodematic has added an overhead gantry with suction cups to lift out heavy long boards such as the 54” x 16’ boards. This allows them to either put the boards in a rework stack or waste stack. Many companies instead of using operators to remove damaged boards, will scrap complete stacks of boards. They are realising that due to the simplicity and speed of our machine that this is no longer necessary and therefore their saving on waste is considerable. Purpose built equipment to handle sensitive and high valve products such as specialist papers and expensive confectionery products. Total positive control allows loads to be turned firmly but gently without damage. Up to 97º turn enabling loads to separate from their pallets. Pallets can be exchanged manually or automatically.